November 18, 2014: Transparency, efficiency and accountability are the stated touchstones for defence procurement under India's new Defence Minister Manohar Parrikar. But those are not new paradigms. Virtually every raksha mantri over the years has spoken out about the need to overhaul the unpredictable, complex and mostly opaque manner in which India contracts for new weapons. But there is reason to believe that the Parrikar MoD could be in a position to put its money where its mouth is on dusting off the debris from procurement disasters of the past and formulating a fresh, practical and most importantly contemporary set of policies that will make weapons contracting in India simple, swift and disaster-proof. If that's a tall order, word on Raisina Hill is that Parrikar already has his mission profile. 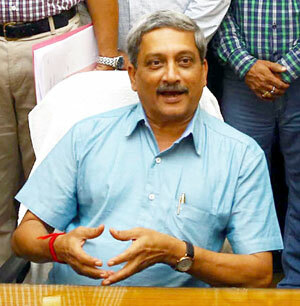 To get things rolling, the new Defence Minister has decided to order an expert committee, that will draw from within the MoD and other departments, to evolve fresh policy changes on two specific processes that India is all too familiar with: the business of defence company agents (described as everything from 'middlemen' to 'representatives' to 'lobbyists'), and the act of blacklisting companies under a cloud of corruption charges. It is an irony missed by few that India's approach to both so far has an effect opposite to the intended one: it has done nothing to eradicate or dissuade the payment of illegal commissions to swing lucrative armament contracts. Top sources tell SP's that Parrikar will be revisiting India's blacklisting protocol, continuing from where his predecessor Arun Jaitley left off. Jaitley, who divided his time between Defence and Finance, had set the ball rolling on evolving a more practical approach by deciding not to blacklist Finmeccanica or AgustaWestland in the aftermath of the cancelled VVIP helicopter contract, instead issuing a set of fresh guidelines that permitted the firms to continue in competitions they already were part of, but limiting India's future exposure to them, pending resolution of attendant legal processes. Parrikar will be looking to take that process forward by refining the parameters and modalities of punitive action by the MoD against companies found to be indulging in illegal practices. Significantly, the modalities will include a definitive and specific flow-chart of when a yet-to-be-decided graduated series of punitive measures kick in, and what recourse the government can take to impose them. These guidelines will dovetail with the existing Defence Procurement Procedure, but also be part of powers the MoD can exercise in emergent circumstances. On the issue of agents or lobbyists, the Parrikar MoD is likely to invite views from industry and experts, including from the Law Ministry. Exercises of this nature have been conducted before, but the Minister has already spoken his mind, providing indications of where the problems lie. The Minister recently stated that defence deals had been hamstrung due to lobbying, kickbacks and commissions, and that he planned to clear pending deals based on a priority list to be provided to him by the Integrated Defence Staff (IDS) via the Chairman of the Chiefs of Staff Committee (COSC). While Arun Jaitley is known to have begun the process of defining company representation and differentiating it from the murky world of 'agents', Parrikar plans to take such documents forward to making them more specific on the roles of company representatives, what they can and cannot engage in (beyond the obvious, of course), the standard operating procedure in terms of interfacing with government officials, and a manual of sorts of company representatives. The end result, a top MoD official tells SP's, is to wind up the unseen, unheard, murky world of defence agents, and legitimise the presence of representatives and intermediaries who actually serve a purpose in the complex conversation that takes place between acquisition managers, armed forces and original equipment manufacturers (OEM) over the course of an acquisition process. These two, however, will only be a fraction of what the intended scope of the 'clean-up' is intended to be. Parrikar, sources say, wishes to revisit stuck deals on a war-footing and get them moving as soon as possible. Deals on the table at present waiting for forward movement include, of course, the 126 M-MRCA deal, but also a plethora of procurements of helicopters, transport aircraft, submarines, mine countermeasure vessels (the floundering deal with South Korea could be the first real test for Parrikar), infantry and special forces modernisation. The Modi government already has two former Armymen in its council of Ministers: former Army chief Gen (Retd.) VK Singh, and Olympic silver medallist Col (Retd.) Rajyavardhan Singh Rathore. While neither of them is in any way associated with the Defence Ministry, their inclusion in government perhaps demonstrates that Prime Minister Modi recognises the capabilities and acumen of armed forces men and women. With Parrikar hitting the ground running by speaking openly about how defence deals have been derailed as a result of corruption, and these have directly affected the armed forces, he has spoken perhaps in the voice of his boss, the Prime Minister. The armed forces will also be looking for Parrikar to bite the bullet on delivering quick decisions, sans the red tape and ad hocism that has plagued decision-making for many years at South Block. "Whatever will be there will be transparent and fast-processed," Parrikar told journalists minutes after taking over as Defence Minister at his first flood office in South Block. A country that has seen the business of war preparedness endlessly politicised and sacrificed at the altar of anti-corruption impulses awaits a brave new India that speaks clearly, transparently and powerfully on those who would seek to derail its interests.